Milford, NH, April 22, 2010 – The task of miking an acoustic piano is never easy and the issue only compounds itself when it comes to live sound reinforcement. Duct tape never seems to hold throughout the performance while mic stands get bumped and, in the process, so does the piano sound. Add in ambient noise from the crowd, stage, and surrounding instruments and, from there, it’s frequently a downhill slide. 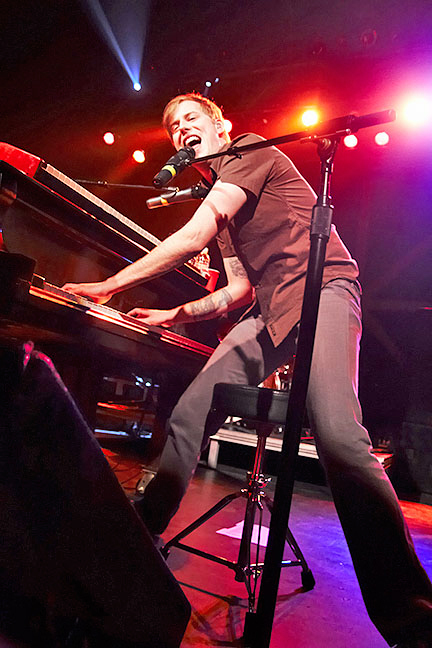 That’s precisely why Andrew McMahon, pianist and lead vocalist for Jack’s Mannequin, relies on the Earthworks PM40 PianoMic™ System to capture the true essence of his piano sound. Originally hailing from Orange County, California, Jack’s Mannequin is a rock band that was formed in 2004. The band began as a side project of Something Corporate frontman Andrew McMahon, and comprises guitarist Bobby Anderson, bassist Jon Sullivan, and drummer Jay McMillan. Having recently finished a headlining tour in the United States as well as a few one-offs, the band recently made stops in Kingston, RI, Oneonta, NY, and Kutztown, PA. Further, McMahon continues his activities with Something Corporate, with whom he performed at the Bamboozle East in East Rutherford, NJ, Bamboozle Midwest in Chicago, IL, in addition to a solo appearance at the Hoodwink Festival, also in East Rutherford, NJ. The Earthworks PM40 incorporates two random incidence, omnidirectional, 40 kHz High Definition Microphones™ with a frequency response ranging from 4 Hz to 40 kHz. With their extraordinary impulse response and extremely short diaphragm setting times, they are ideally suited to perform within the piano’s highly diffused sound field (multiple direct and reflected sound sources). Equally significant, these microphones exhibit no proximity effect (change in LF levels), regardless of their distance from the piano strings or soundboard. The result is a remarkably consistent piano sound across the entire range of the instrument.